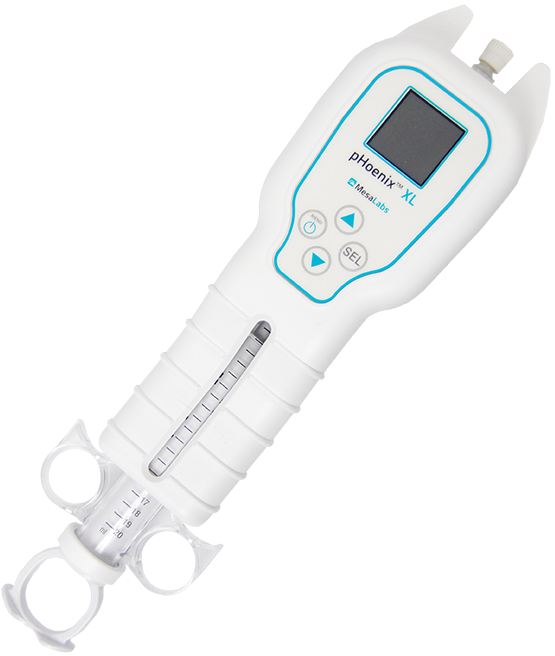 The pHoenix XL is a convenient, hand-held, syringe-style meter for quick and accurate measurement of conductivity, temperature and pH in dialysate for nephrology clinicians and technicians. Mesa Labs is pleased to announce the release of the newly re-designed digital dialysate meter from its DialyGuard product line for nephrology clinicians and technicians, the pHoenix XL. The pHoenix XL is a convenient, hand-held, syringe-style meter for quick and accurate measurement of conductivity, temperature and pH. The easy to follow calibration guide and one-touch calibration buttons give you added assurance that readings are accurate and reliable. The syringe-style design allows for you to gather a sample directly from a sample port on the dialysis machine saving you time. Simply order a new, calibrated replacement module, replace, and you are all set! Mesa Labs looks forward to continuing to serve our loyal customer base and the dialysis industry as a whole. For more information on the new pHoenix XL meter, visit Mesa online today at http://www.MesaLabs.com.